In addition to the species below, we also see mountain lions (a.k.a. 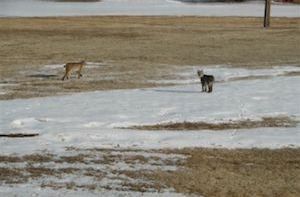 puma, cougar, or catamount), several hawk species, prairie falcons, coyotes, and badgers. We have plenty of western prairie rattlesnakes, raccoons, skunks, porcupines, and prairie dogs, but we don't revel quite as much when we see them. All photos taken by Chuck Hughes unless otherwise noted. 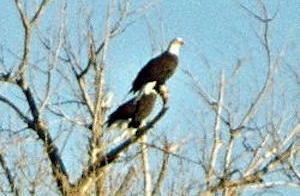 These bald eagles supervised my cattle feeding operation during the winter of 2010. 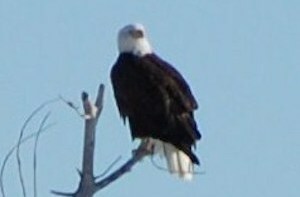 I see one to four bald eagles almost daily in the winter. They are shy enough that it is difficult to get a really good photo. These were taken with a 300 mm lens. Above is a golden eagle soaring above the ranch house and giving us a magnificent air show. 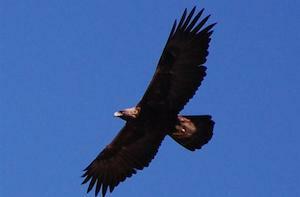 Golden eagles are seen year round and have nests in the forest and ridges to the west of Cwm Ceffyl and there is one big nest in a tree next to West Bijou Creek. We like to watch them help reduce the prairie rat population. 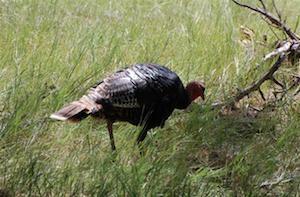 There is a growing and thriving group of wild turkeys in the forest just to the southwest of Cwm Ceffyl Ranch. This photo of a hen turkey looks like she is trying to become invisible. 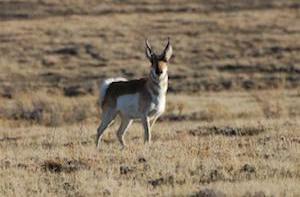 This pronghorn buck is so familiar to the ranches in our area that we call him Fred, or Fast Freddie. He's a welcome and frequent visitor to Cwm Ceffyl. 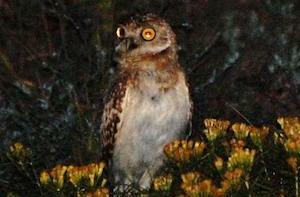 These photos were taken right in front of the Cwm Ceffyl Ranch House. 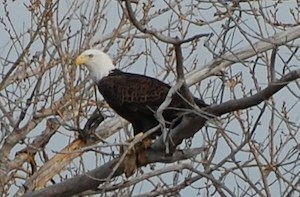 Check out the prairie dog in this bald eagle's talons. Bald eagles prefer fish, but if fish aren't available, the prairie dogs will do just fine. 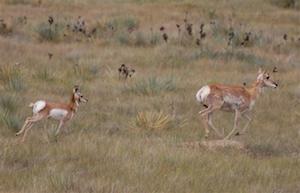 It's always fun to see a doe pronghorn with her fawn. Even the very young ones can cover some ground in a hurry. 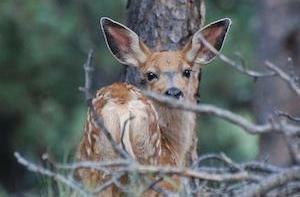 This mule deer fawn is still sporting spots. It was one of twins, but this is only one I caught in the photo. Beautiful youngster. Memo to barn cats: "Look out! This is not your average bird." 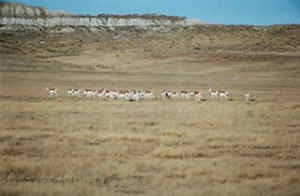 Above is a herd of North American pronghorn. We see them almost daily at Cwm Ceffyl Ranch, in groups both large (in late summer, fall, and winter) and small (in spring and early summer). 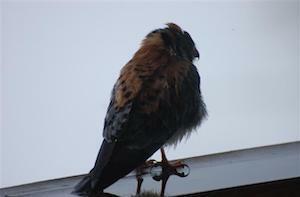 At one time Kestrels were mis-named the sparrow hawk, but are not a hawk at all. They are a falcon. 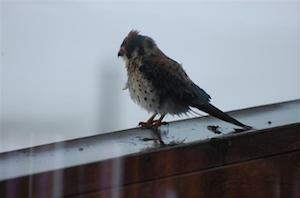 This kestrel was hanging out on the ranch house deck railing during a wet April snowstorm. 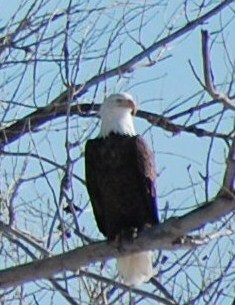 Bald eagles are seen almost daily in the winter hunting from the trees along West Bijou Creek. The two at pictured at the left were watching me feed the weanling calves in February 2008. Unlike great horned owls, who will often stay put even when closely approached, the bald eagles take off before I get close enough for a really good photo. 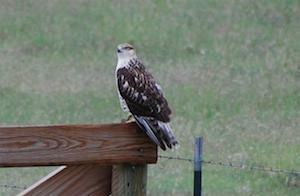 The most commonly seen raptor at Cwm Ceffyl Ranch is the red tail hawk. 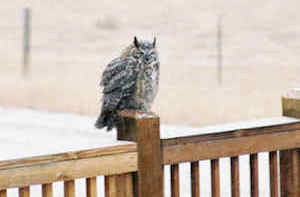 This one was watching for it's favorite meal, prairie dogs. At right is the same hawk in flight. It's quite obvious how it got it's name! Kestrels are seen with some regularity at Cwm Ceffyl as they help with controlling the rodent population. They are the smallest member of the falcon family and are amazing aviators. They can fly quite fast and can also hover just like a hummingbird. 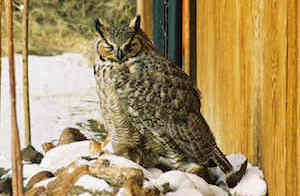 Great horned owls are fearless raptors and efficient nocturnal hunters and can be approached fairly closely. This one stood it's ground as one of our Border Collies charged it while barking. 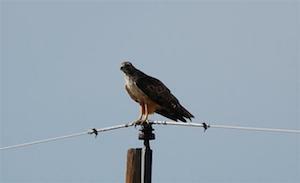 Photo taken July 2009, from the house deck, of a Swainson's Hawk. Swainson's Hawks are known for their long migrations between South and North America. 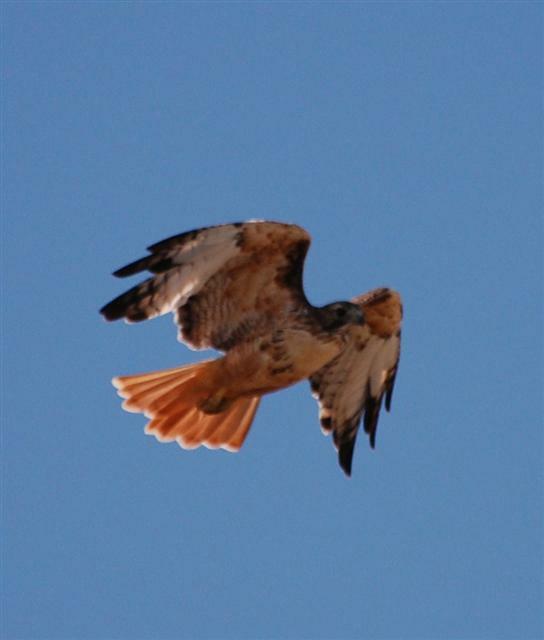 They are smaller in size than the more common Red Tail Hawk, but have a greater wing span. 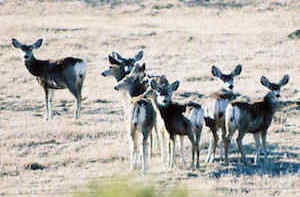 This photo of some beautiful mule deer was taken on an early February morning from the front deck of the ranch house. The deer are often seen going between the cover of the trees to the west of the house and the water in West Bijou Creek to the east of the house.